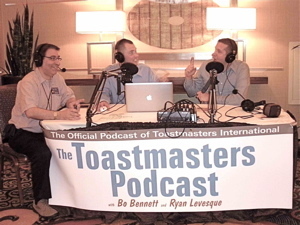 Recorded live from the 2009 Toastmasters International Convention. We introduce the Official Toastmasters Podcast by interviewing co-hosts Bo Bennett & Ryan Levesque formerly of Talking Toastmasters. They share with us what to expect from the new podcast and how will it will differ from their previous incarnation. They'll also talk about a couple of episodes they've already done, including their take on SpeakEasy -the forthcoming documentary on Public Speaking and stories emanating from this year's Convention here in Mashantucket, CT. Be sure to tune in - it'll be loads of fun and quite a few laughs too as Bo & Ryan do their thing and also poke fun at yours truly, Greg Gazin.